The Annual Dinner will be held in celebration of our chamber volunteers and members. 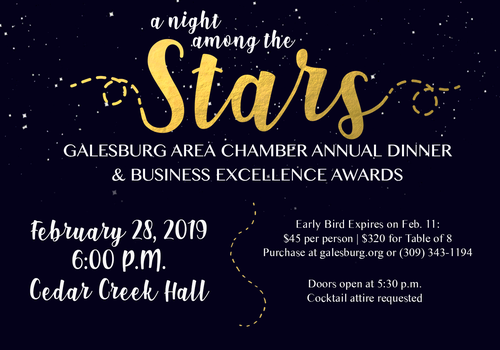 The evening will feature updates about the work the chamber is doing, the Business Excellence Awards, and honor 20 Under 40 recipients. Doors open at 5:30 p.m. and cocktail attire is requested. Early bird registration tickets are $45 or $320 for a table of eight. After February 14th, ticket prices will be $50 per person or $360 for a table of eight. Early bird registration is $45 per ticket or a table of eight for $320. After February 14th, prices will be $50 per ticket or $360 per table.